2. 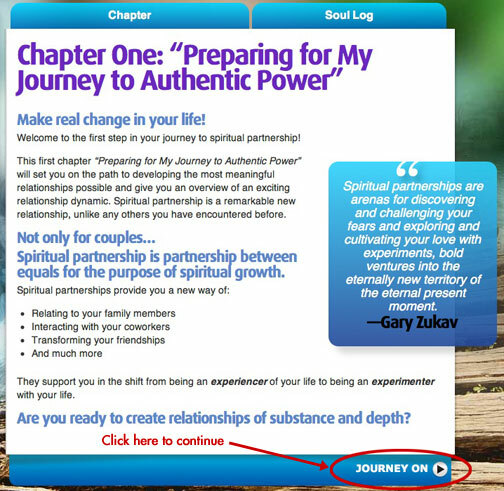 Click BEGIN CHAPTER 1 (or Awakening to Spiritual Partnership in the side box). Enter your username and password. 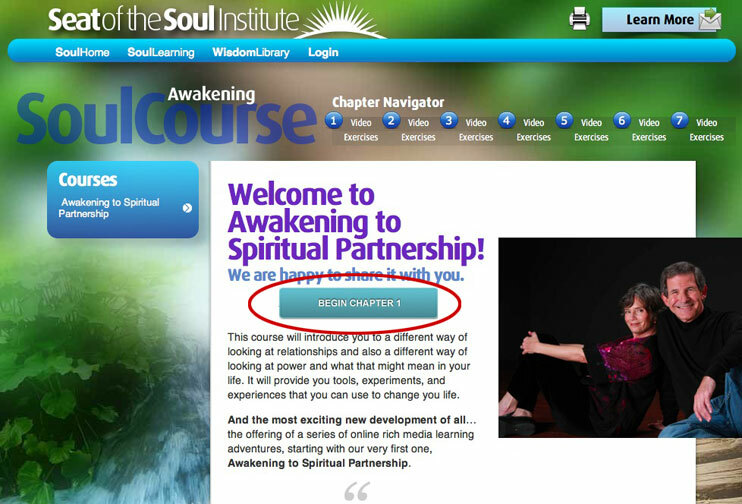 If you are already logged in, click the blue circle of the chapter you wish to begin. Click JOURNEY ON in the bottom right corner of the text box. 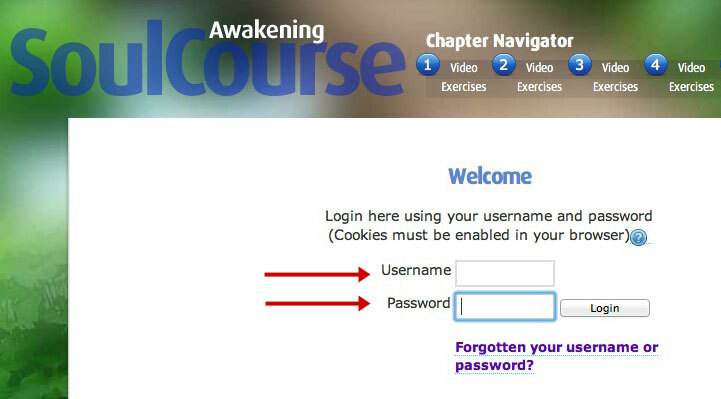 How to use the Chapter Navigator: Click a blue circle to go to the Welcome page of a chapter. Click a Video link to go to the first video in a chapter. 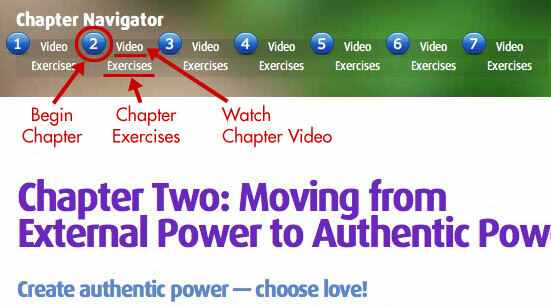 Click the Exercises link to go to the Welcome-to-the-Chapter-Exercises page in a chapter. Click the Play arrow to watch videos (the control bar disappears when you move the cursor off the video player). 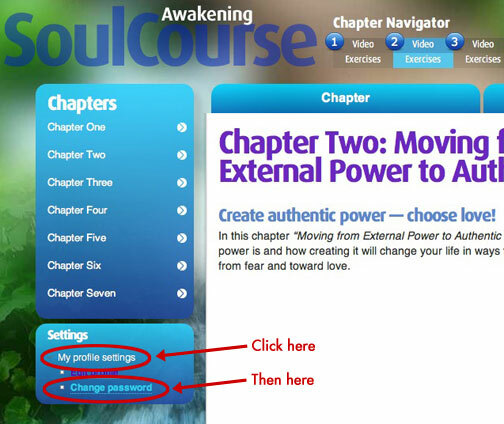 Click the SoulSupport link beneath each question to see helpful clarifications and resources. 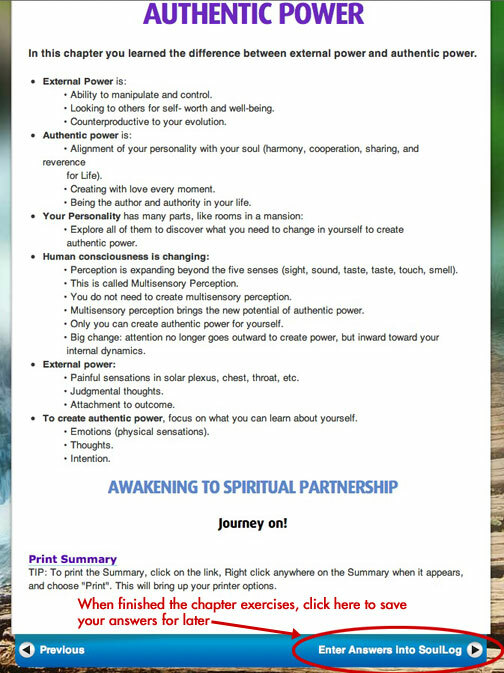 Think of this feature as a way that your Soul might choose to support you in creating spiritual partnerships. Before you JOURNEY ON to the next page, write your experiences, insights, observations, thoughts, and anything else you learned about yourself in the box at the bottom of the page, if there is one. 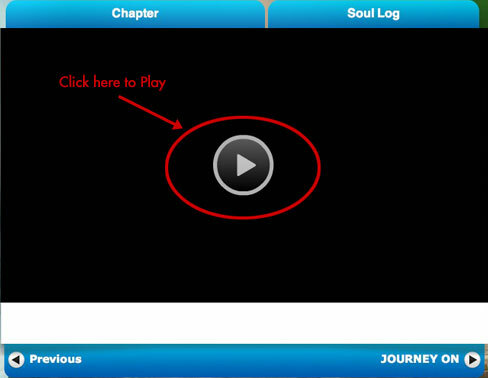 You will be able to read your entries in the SoulLog after you click the Enter answers into SoulLog link on the Review Video page. If you want to change an answer after you complete a chapter, go back to the question and enter another answer. 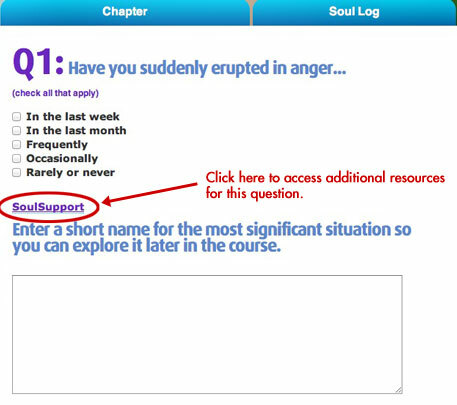 You will be able to read your new answer after you click the Enter answers into SoulLog link on the Review Video page. 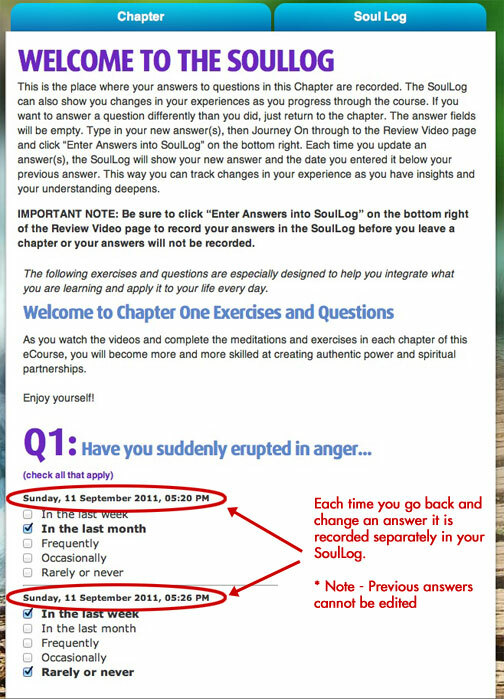 Then you will be able to see your new answer in the SoulLog and the date you entered it along with your original answer and the date you entered it. To personalize your password, click My Profile Settings in the left side box labeled Settings, then click Change Password. When you are finished, click Save Changes. To print a Chapter Summary, follow the directions below the Print Summary link. 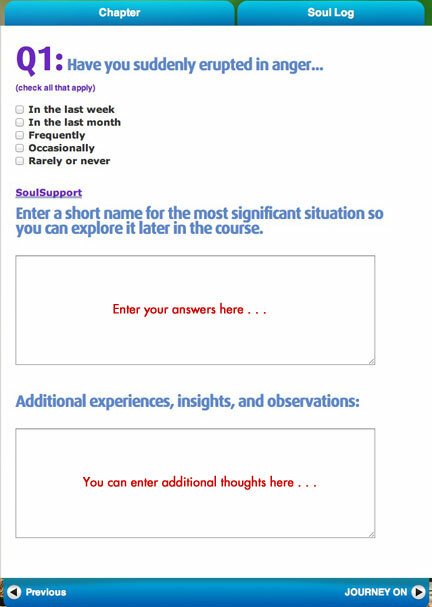 Be sure not to close your browser window before you click Enter Answers into SoulLog, or your answers will not be recorded in the SoulLog.